But, I for one, I love to have some music playing whilst doing DIY or work on my day job on construction and building sites. The day goes faster and smoother, don’t you think? If you are looking to buy a job site radio for yourself, I have put together a list of top job site radios that can help you decide for which one should you go. 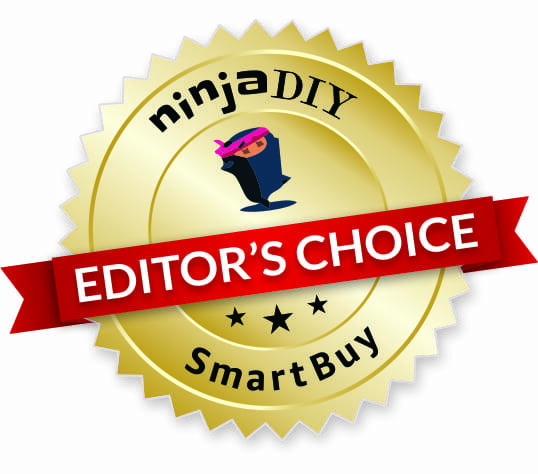 ☛ By the way, if you are a busy man/lady and don’t have a lot of time to read this awesome review article that I’ve done for you today … here’s a shortcut to Amazon if you want to see which is the best jobsite radio in my opinion! 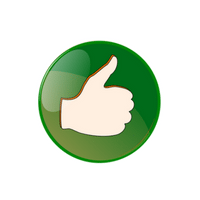 If you do have time, awesome … let’s get right into it and see what radio players people liked the most to use whilst at work or at home doing DIY. One of the most important things that I’ve considered when decided for which work radio to include on this top 10 list was that it had to be heavy-duty, rugged, made to last in harsh construction environments. 2 Here's An Awesome Tool Fight From YouTube: Which Radio Is The Toughest? 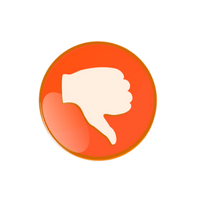 3 Conclusion: So What's Your Favorite Worksite Speaker From My List? This one is my preferred jobsite radio and I tell you why: IT CAN CHARGE YOUR DEWALT BATTERIES. That’s right. This radio player can run on electricity or cordless using batteries, but as well, a huge advantage it has over other models and brands is that it can charge your batteries whilst you listen to music. This is a very good radio to take with you on a building site. Its rugged design stands up to the rigors of the job site. Another awesome thing about the DeWalt DCR015 is that it has a small compartment where you can put your phone or your mp3 player. You can check out as well this model as well if you want. The DeWalt DC012. I didn’t want to make a huge list of radios so I didn’t include all the brands and models in this post. But the DC012 it’s a good option as well. It has almost 500 reviews on Amazon. This way will stay safe of damaging them. It’s not that heavy, actually it’s lighter than other DeWalt worksite radios, weighing about 13 pounds. The Milwaukee radio speaker it's one of the most expensive radios that I have on my list today. You can use it to listen to music while doing DIY in the home back garden or take with you on a professional building site. It has a great volume and the clarity of the sound is quite good having premium speakers and 40 Watt amplifier that produces rich, full sounds for clear audio. You'll find helpful the weather-sealed compartment that offers onboard protection for small belongings and smartphones. How about the on-board bottle opener? 🙂 It might be a great feature if you work in your home and want to open a couple of bears. Just like the DeWalt DCR015 mentioned above, the Milwaukee M18 radio charger comes with a built-in charger that quickly and conveniently powers up all Milwaukee M18 Lithium-Ion batteries. Built-in charger for power tool battery charger that also serves for the battery to supply power to the radio. Power cord handles to wrap the power cord around. The unit exterior look like is able to withstand mild/reasonable accidents or abuse. This one looks amazing. Actually, looks like is the toughest one to break from my list of Bluetooth speakers. As I've said already, this is probably the most important thing you should look at when deciding for which job site radio to buy. Featuring a protective aluminum and rubber roll cage and a weather-resistant and dust-resistant design. Great quality speaker. Comes with Bluetooth Technology, of course, to connect it to your smartphone. And it can be used as far as 150 feet apart. Great range, giving you more freedom to move around. It's working on Bosch 18-Volt batteries or plugged into a 120-Volt AC outlet. Comes with a built-in battery charger for charging and four 120-Volt power outlets for connecting tools and other devices. It takes a lot to charge the batteries. And besides, I have one as well and I can vouch for it. It's a very nice little device that runs on DeWalt 12V MAX/18V/20V MAX battery packs. Just like the other ones, it has a small storage place where you can keep your music devices or smartphone safe. Can this Dewalt radio charge a 20v battery when plugged into a wall outlet? Here's another brand that has a lot of fans, especially in the DIY world, let's see this Ryobi job-site radio. Or you can plug this straight into your wall with AC power. It is a versatile Bluetooth speaker, with the ability to play music from its AM / FM radio or from your phone or mp3 player. Not bad, considering it costs less than a hundred bucks. The Makita XRM06B Bluetooth Job Site Radio delivers rich sound and increased compatibility in a more compact size. It is a good addition to any workshop or building site. It is equipped with Bluetooth to wirelessly connect your mobile device to play music. It has one auxiliary port for MP3 compatibility and delivers rich stereo sound from two powerful 3" side-firing speakers. The XRM06B is engineered to stand up against harsh job site conditions with protective bumpers and features dust and water resistant construction for increased durability. This radio player can be powered by Makita 7.2V, 12V max, 12V max CXT, 14.4V, and 18V LXT Lithium-Ion batteries. One key thing about this portable speaker (for some users) is that is quite loud. Something that I personally don't like about the Makita job site radios is that Makita is discontinuing the models very often. So if anything happens to your device in the meantime and you want to change it or whatever ... they might not manufacture that model anymore. Just be aware of that! And the feature I was talking about is the option to control the radio remotely through the Ridgid radio app using Bluetooth wireless technology. Dual power supply powered by any Ridgid 18V battery or attached AC cord. Weather resistant protects the radio from job site conditions. A perfect feature for contractors. Can charge your phone and other USB compatible devices. And, If you don't want to use the Bluetooth for whatever reason, you can connect your phone to listen to music via the aux connection. A very nice looking portable and heavy-duty speaker. It has a protective rubber frame on the outside which will serve nicely as protection from falls and bumps. Bluetooth wireless music streaming ability. You can use it to charge your phones having USB ports and as well you can connect external speakers if you want to, via the aux connection. AM/FM radio with digital LCD display. It provides an amazing stereo sound reproduction with an impressive bass output. The Pyle job-site-radio unit has a built-in battery charger. It's on ‘auto-charge’ mode whenever the (supplied) A/C cord is plugged into an A/C outlet. If you switch it off whilst charging ... the charging is completed sooner than when is ON. The internal battery cannot be removed for external charging. ....otherwise, you won't be using it for too long the next day! Well, I guess, we learn something new every day! This Sangean radio box really looks like the old style boombox with a tough roll cage design. This cage can withstand falls from 6 feet high and survive up to 250 pounds of weight. While plugged in, this unit can recharge batteries. Not just any battery type though, it has to be universal D-size Ni-MH batteries. This radio player has a whopping 1200 plus reviews on Amazon as well, which is impressive. Now, look at this. What a beautiful worksite radio player. This would look amazing in a garage/workshop ... it can beautifully fill a small place with some great sound. It has some interesting features like integrated carry handles plus tool, bit, screw & socket storage. This is the only one from the list that especially states it has IPX5 rating .... which means it's water and dust resistant. Excellent feature for contractors in the construction business. The ION brand again is not very known (at least to me) but seems that people like the brand. Have a look for yourself here. not be producing good sound at high volume. Here's An Awesome Tool Fight From YouTube: Which Radio Is The Toughest? Conclusion: So What's Your Favorite Worksite Speaker From My List? Please tell me what's yours! If you can't remember what was my choice, here's again a link to Amazon where you can see what I believe to be the best job site radio player for contractors and DIYers. One thing I want to remind you is to check the product description for: "Batteries Included" ... Some people were disappointed to find out (after buying the device) that the batteries were not included, so now they have to spend some extra cash. What radio player are you using at your workplace? 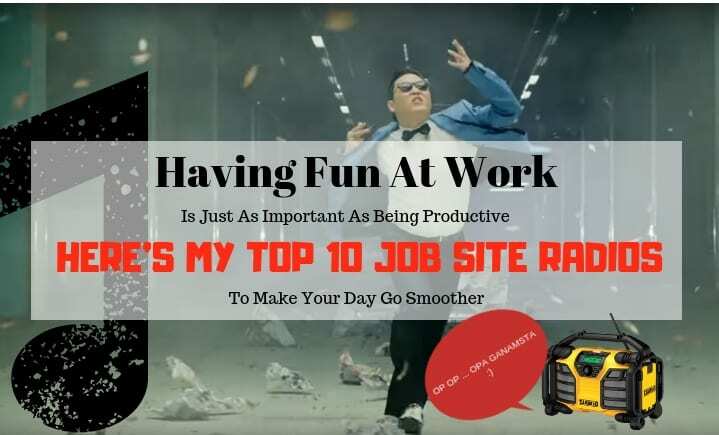 Which one do you like from my TOP 10 best jobsite radios list? 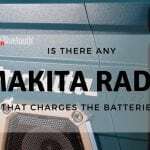 Makita Radio That Charges Batteries - Is There Such A Jobsite Radio Available On The Market?